These are simple shop set ups and work habits that, while not original or profound, nevertheless make a real difference in helping me get things done in the shop. 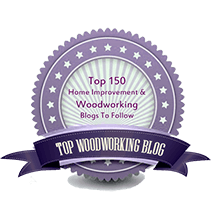 If a fellow woodworker was observing my shop and work habits, he might remark, “I notice that your shop has . . .” or “I notice that you . . .” So, I’m passing along these little helpers with the hope that they will be helpful to you too. 1. Remote switch for the dust collector. I can operate the dust collector without leaving whatever machine I’m using. In my small shop, the low-budget 610 CFM dust collector’s hose goes to each machine as it is used. The remote switch, purchased at a local Ace Hardware, just plugs into the wall outlet and easily handles the 120V/8.0A motor. 2. Autostart shop vac. I would not want to use the random orbit sander and the oscillating spindle/belt sander without this type of vacuum. The tool plugs into an outlet on the vacuum which cycles on and off when operating the tool’s power switch. There are many brands and models of shop vacs with this feature. I find my old model Fein Turbo II to be quiet and efficient. 3. Magnifier on workbench lamp. This is handy to have readily available for checking for a nick in a router bit, or a million other tiny things. Various models are available in art supply stores, at Rockler, and other sources. 4. Rechargeable light. 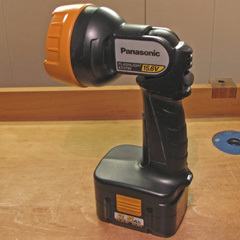 I use this all over the shop for many jobs where I want a more directed light, such as at the bandsaw, or to create a low, glancing light, such as for evaluating the surface quality of wood while using a smoothing plane. 5. My large hand tool cabinet is two steps to the right of my workbench. I reach for tools quickly, without breaking the flow of working. Since I am right handed, the cabinet feels naturally accessible off to my right. 6. One-reach tool storage. As much as possible, I like to store tools that are directly accessible. I don’t like the feeling of hesitation or inhibition that seems to arise when a tool must be unearthed by moving other gear. 7. Wear an apron. Somehow, putting on my apron gets me oriented for work. It seems to tell me that now it’s time to get serious and get work done. I feel more free about wiping my hands on the apron than I would on my clothes, and I freely lean into dusty work. I’ve found the Lee Valley canvas apron to be just right. 8. 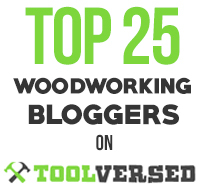 Separate planing from sanding, and metal working from woodworking. Sharp tool edges are vulnerable to sanding grit. I also don’t like the idea of hacksaw “dust” and metal filings getting into the grain of my workbench or work pieces. So I separate these processes with a good clean up with the shop vac. Simple stuff that helps. Happy woodworking. Good post. I do a few of these and of those that I don’t, #3 gets my attention the most. That remote looks good. I always figured they were more expensive than that. The shop apron, with the lower pocket openings vertical instead of horizontal, will be a big improvement. Mine are an open trap for shavings and dust, needing to be emptied and shaken out constantly (during which often I loose my 6″ rule and pink eraser), and occasionally get caught on edges of machines and benches. Also, it is canvas, not leather, another plus. The portable lamp also looks really good. It’s great not to have to reach for chords and plug things in. I have two workbenches, one made to Frank Klausz’s specs which is treated “with loving kindness” for clean woodworking processes and another nearby, smaller and narrower, with an elm top and metal Record vices, for more rough and ready use; metal filing, rough lumber, morticing with router jigs, as an extra surface to put parts on, etc. It has really helped the flow of work at the main bench. As always, thanks for the well considered shop tips. Have you posted about your set-up using your Shapton stones? If you haven’t already (and if you have, can you point out where? ), could you shoot a couple photos of your hanging tool storage layout and give a brief overview of what you like and don’t like? I was excited when Dan (from dans-workshop.blogspot.com) started showing some of his earlier this month and would like to see if I can get similar shots from others. It is what I’ll be working on next for my shop and I would like to know what works well before I spend any time building something that others have shown doesn’t! I tried the magnifier on the bench but I think there might be a better option. A jeweler I know uses a headset with magnification lenses. 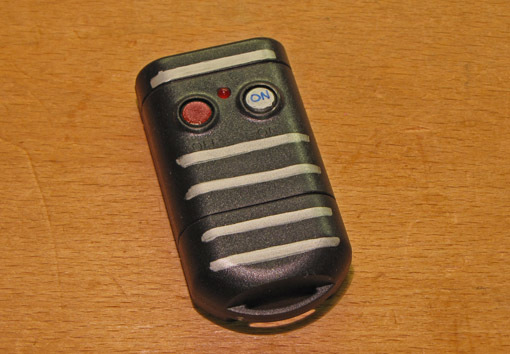 The headsets can have lights and variable magnification inserts. The benefit is mobility. You don’t bring the work to the magnifier – you take the magnifier to the work. 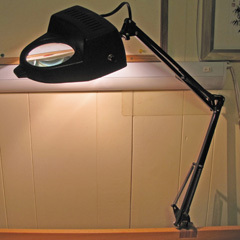 The magnifier on the lamp is quick and ready to use. John, I agree headborne loupes are very useful. I use a Donegan Optivisor with a 4 diopter lens which works very well for me and has better optics than the lamp lens. It’s just not as handy as the lamp magnifier for a quick peek at something. Please see my article, “Better Vision in the Shop,” in the current (February 2010) issue of Popular Woodworking, pp 63-65 for more on this topic. If you can get a hold of Popular Woodworking October 2007 (#164), my sharpening station is on page 16. All the back years of PW are available on CD. I’ll try to get something posted soon about the tool cabinet. I’ve just got to find a round toit and they’re hard to find in between making stuff in the shop. Throw me an email if you need info/pics sooner. Rob…these are great ideas that lead towards better productivity and more piece of mind. It’s easy to see that they allow for a better workflow. The remote, magnifier, rechargeable light, and apron are things I plan to implement immediately. Thanks for sharing. Thanks, Bob. More tips on the way.